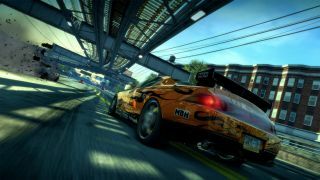 Burnout Paradise Remastered will launch on PC next Tuesday, Criterion games has announced. The Remastered version of Criterion’s open-world racer released on console back in February, but PC players have had to wait another six months for the game to careen into their particular intersection. While Burnout Paradise Remastered will become available for general purchase on August 21st, if you subscribe to Origin Access, you can play right now. Subscribers to the basic version of access can play a ten-hour trial, while users of the premium version can play the full game immediately. 2018 has proved surprisingly fruitful for destruction-centric racers. In June, Bugbear Entertainment’s Wreckfest launched out of Early Access, proving to be a fun, if somewhat limited racer. Meanwhile, former Criterion devs Three Fields Entertainment released another spiritual homage to Burnout’s crash mode in the form of Danger Zone 2. It’ll be interesting to see how Paradise stacks up against these newer games ten years on, although I reckon it’ll manage just fine. The announcement trailer for Paradise Remastered is below, if you want a little taste of what’s coming next week.